Almost a week after blast rocked the Ramsey Natural Gas Processing Plant in Orla, Texas, the long lasting fire is out, officials said. 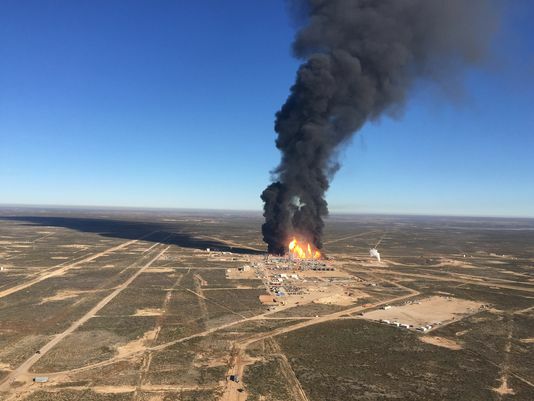 The last fire flickered out after Anadarko Petroleum Corporation, which operates the plant, reduced the amount of natural gas feeding into the fire, said Eddy County Fire Service Director Robert Brader. “They are going to attach flares to the gas lines that feed into the plant so that it reduces the pressure of gas feeding the fire,” Brader said. He said by attaching flares to the gas line away from the plant, it would reduce the gas pressure from the gas that is in the plant. The fire was the result of a plant explosion Dec. 3 at 9 a.m. The company had no updates for the public about the incident, said John Christiansen, Anadarko vice president of corporate communications. It remains unknown how much damage occurred to the facility or how long it will take to recover. “I was told by one company official that the costs of damages could be around $50 million,” Brader said. Eddy County Fire Services, including Otis Volunteer Fire Department and Happy Valley Fire Department, are the only fire personnel on scene, as they are the closest fire departments to the incident. Additional fire departments in Eddy County have been switching off over the last five days to monitor the fire and prevent it from moving outside of the plant. Brader said there have been no complications over the past few days and the company continues to work with fire services. Juan Rodriguez, an official spokesperson with the Occupational Safety and Health Administration (OSHA), said last Friday OSHA is investigating the incident. On Monday, Rodriguez said the investigation remains open and ongoing and did not have any public information available.